RadioComm can be used to program your Icom radio's memory, or to create nice radio-frequency spectra (see above) or to interface your radio to a huge database of frequencies. Radio programming programs for YAESU and ICOM handheld transceivers. VX-7 Commander, VX-2 Commander, VX-5 Commander, VR-120 Commander, and IC-R2 Commander. All software on this site is designed to work on Windows 9x, ME, NT, 2K, and XP. By utilizing this software, you can enjoy the versatility of the TH-F6/ F7 transceivers through the memory channel management and edit functions. FT857 Programming Software works with FT817 FT897 too. Demo version available. FTBVR5K is a memory management program for the Yaesu VR-5000 scanning receiver. Memory management program for the FT-60R/E FM handheld. FTRestore - FTRestore is a free Windows desktop application to upload, download and compare memory channels and menu settings in the Yaesu FTDX1200, FTDX3000 and FT-991/FT-991A model transceivers. RadioComm - RadioComm can be used to program your Icom radio's memory, or to create nice radio-frequency spectra (see above) or to interface your radio to a huge database of frequencies. CI-V Test - CI-V Test for Win98 (others not tested, but should work) is a simple freeware program to display received CI-V messages in Hex and text, and send commands for test purposes to the rig. This program is not intended to convienently control your rig, just explore the functions of CI-V.
Freakin Beacon Setup Program - A small program to simplify changing messages in the Expanded Spectrum Systems Freakin' Beacon controller. The program makes it easy to modify an existing message or to have multiple messages available in different files ready to program into the beacon controller. FreeSCAN - Freeware windows program for programming the Uniden SC230, BC246T, BC330T, BCD396, BC15T and BCD996T scanners. FreeSCAN allows to download and uploading programming, remote control the scanner, log hits, and supports printing out of systems and groups. FTB60 radio control - Memory management program for the FT-60R/E FM handheld. FTBVR5K - Free memory backup/restore program for the Yaesu VR-5000 receiver. KG-UV Commander - Free programming software for the Wouxun KG-UVD1P, KG-UV2D, and similar radios. link7 - link7 is a Windows 9X program to download/upload data from/to the Kenwood TH-D7. MCP-D7G TH-D7A TH-D7E Memory Control - This program is for editing Memory Channels APRS, SKY COMMAND II and various settings on the kenwood amateur radio TH-D7A(G)/D7A(G2.0)/D7E(G2.0) A similar version exist for TH-D7 generation 1. Pro Mem Edit - Pro Mem Edit for Win98 (others not tested, but should work) is a small program to read, edit and store the memories of the 756Pro, 756Pro2. TH-F6A / TH-F7A / TH-F7E Memory Control Program - By utilizing this software, you can enjoy the versatility of the TH-F6/ F7 transceivers through the memory channel management and edit functions. Yaesu FT-817 FT-857 FT-897 EEPROM analyzer - A Java multiplatform application used to find EEPROM locations for different radio settings. a very simple to use multi-platform Java application which can be used to find EEPROM locations for different transceiver settings. This information can then be used to send the right CAT commands to configure the radio remotely. Use this application on your own risk. 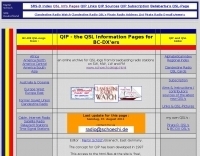 Search only in "Radio programming software"